The Queen Mary welcomes back the annual celebration of authentic Scottish heritage at ScotsFestival & International Highland Games XXVI February 16-17. 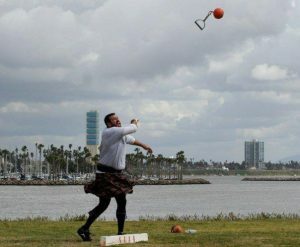 ScotsFestival will present the new All-American Professional Highland Games to this year’s festivities, welcoming internationally decorated athletes to compete for titles in traditional competitions such as caber toss, throwing the weight, the hammer throw, putting the shot, and the sheaf toss. This year’s games welcome the highest level of Professional Scottish Athletics to compete in the new All-American Professional Highland Games. Professional, Amateur, and Master Athletes will compete in several categories of traditional Highland competitions with final scores entered into the North American Scottish Games Athletics database. Those scores generate the invitations to Professional Highland games, which are invitation only, based on success in competition. “The Queen Mary is a fantastic venue to watch local and visiting athletes compete. It has been our favorite place to begin the Highland games season in Southern California for many years.” shared Catherine Ballard, Athletics Committee Member for ScotsFestival. Scots have been honoring ancient Celtic traditions with athletic competitions for centuries, testing physical strength, skill and technique. The All-American Professional Highland Games welcomes some of the most acclaimed athletes to the Queen Mary to demonstrate their ancient warrior skill set, including some local stars who are from Southern California. Growing up Lake Forest, California, Jon O’Neil was an NCAA All-American Shot Putter and Discus Thrower in college before competing in Olympic trials in 2000 and 2004. He won the International Highland Games Federation (IHGF) World Team Championship in 2012 and is the current North American record holder in Braemar Stone, who will be competing in the Professional division in the All-American Highland Games. Colin Dunbar graduated from Long Beach State University before becoming five-time USATF national champion competitor in the Olympic hammer throw and an Amateur World Record holder. In his first year as a Professional Athlete, Dunbar will be participating in all nine traditional Highland competitions offered at this year’s ScotsFestival. ScotsFestival & International Highland Games XXVI welcomes nearly seventy Scottish clans and vendors throughout the festival weekend with professional and amateur competitions in piping, drumming, massed bands, darts, Highland dancing, and the new All-American Professional Highland athletics. The Scottish Highland Games, a precursor to today’s Olympic Games, were designed to test the strength, skill and technique of ancient warriors through faceoffs in caber toss, throwing the weight, hammer throw, putting the shot, sheaf toss and more. Tickets to the 26th Annual ScotsFestival & International Highlands Games are on sale now and start at $25 online (ages 12+) and $12 online (ages 4-11) for one day general admission. VIP tickets start at $45 online. Upgrades, ticket add-ons, and hotel packages will also be available. Discounts are available to military and seniors. Visit queenmary.com for more details and to purchase tickets online.